This house used to be a library to the house next door, was sold off and converted post war. Long and thin with poor light and a tortuous connection to the garden from basement stairs, it also has a wonderful first floor living room overlooking one of the best views in London, high up on Richmond Hill over the park and the Thames. With the street elevation too sensitive to disturb and having two significantly taller buildings either side, the proposal had to utilise the roof and rear elevation as the source of natural light. The rear of the house and the roof were rebuilt, whilst the front half of the house was retained and upgraded. The key move has been to raise the basement up at the rear, whilst lowering a good portion of the garden down to meet it, therefore forcing the house to connect to the garden. This single move allowed for a one-and-a-half height kitchen / family room with a new glazed dining room attached. In the centre is a staircase which is transparent at ground and first floor to give views through. On approaching the house we have retained the stair down off the street and the entrance at the basement level. As you enter the oversized front door the hallway has been widened, promoting use as a gallery for our clients, professional photographers. The hall wall curves around to open up the view of the new parts of the house. The proposal involved a single storey rear extension and a minor extension at roof level. The proposal was procured in two separate planning applications. The single storey element went under Permitted Development while the second floor element went under a Full Plans Planning Application. Permission was granted in June and August 2005 respectively but programme constraints were placed on the project to ensure that the rear extension was completed before any work was started on the second floor. This was to ensure that no permitted development volume reserved for the extension would be used-up in the second floor element. 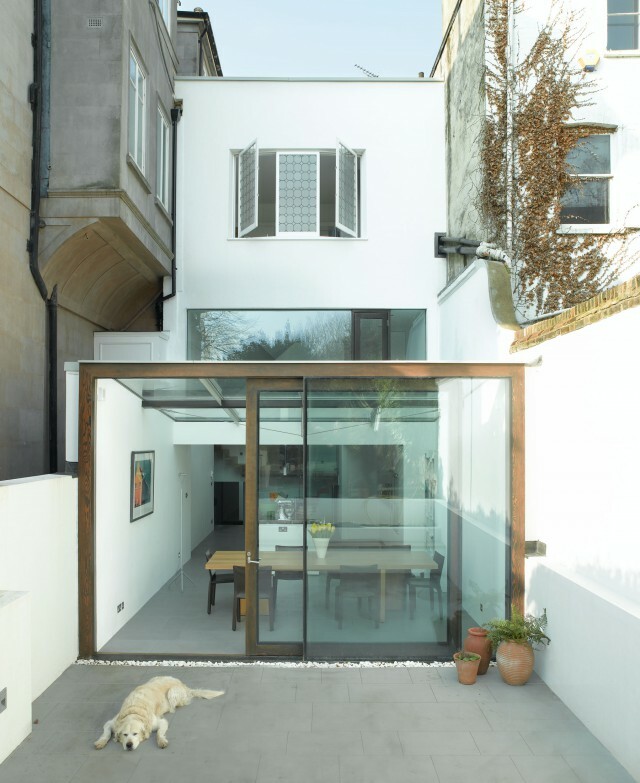 As the rear extension was primarily structural glazing, this proved to be a difficult construction process. The window to the rear elevation at second floor level had to be retained and re-instated. 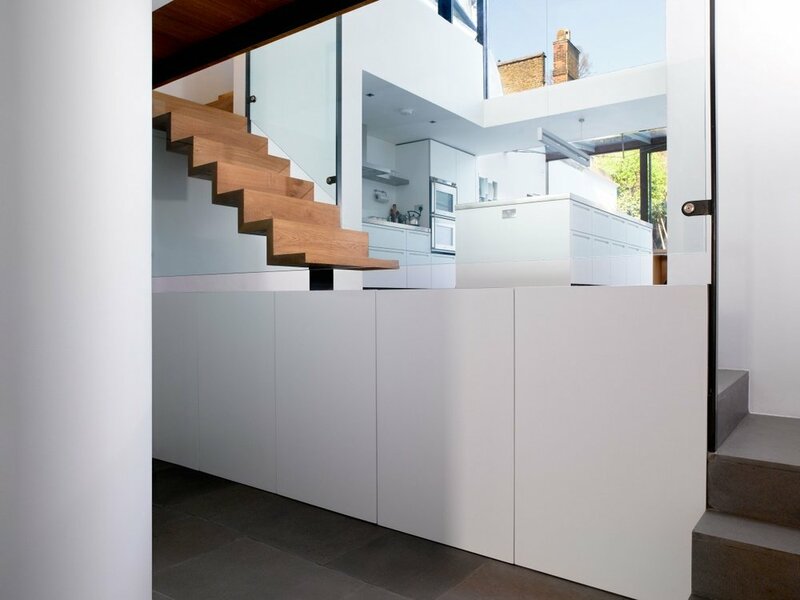 The rear extension sits on a ground-bearing concrete slab and is raised half a storey above the lower ground floor entrance level. This brought it level to the rear garden. 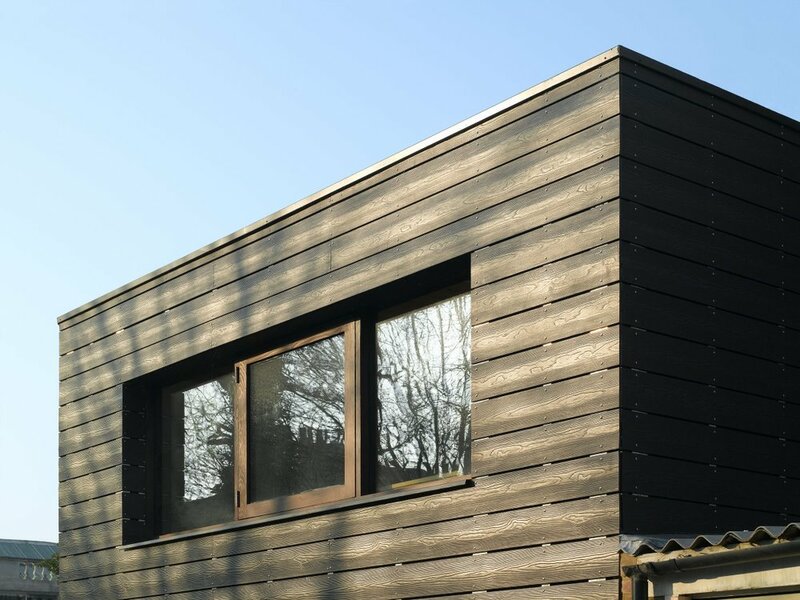 The walls are blockwork with a render-on-insulation finish. 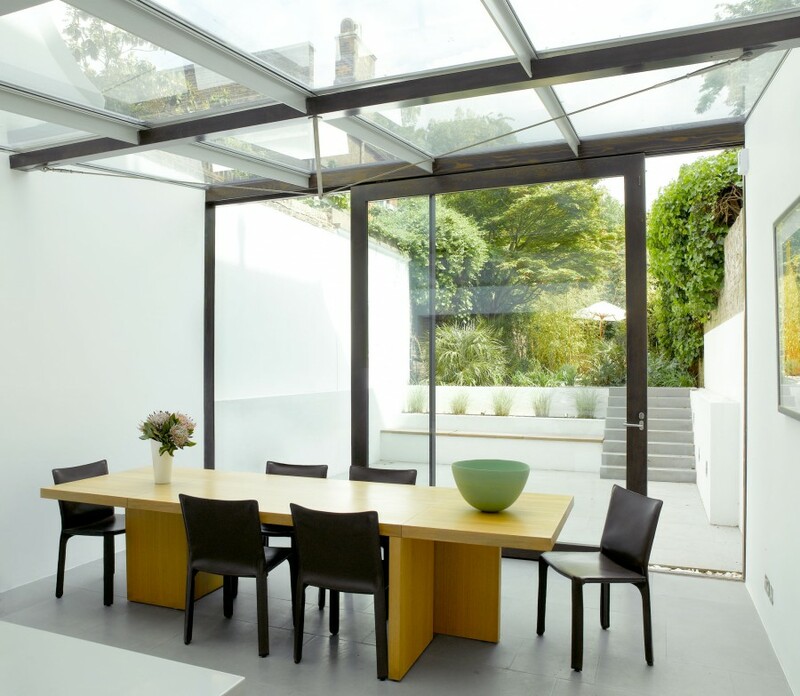 The extension roof is a proprietary glazing system with a bespoke bow-string truss support, and the large rear glazed facade is structural glass. Internally, the flooring on the lower ground floor is dark grey limestone and on above levels is an engineered timber floor suitable for the under-floor-heating system throughout. 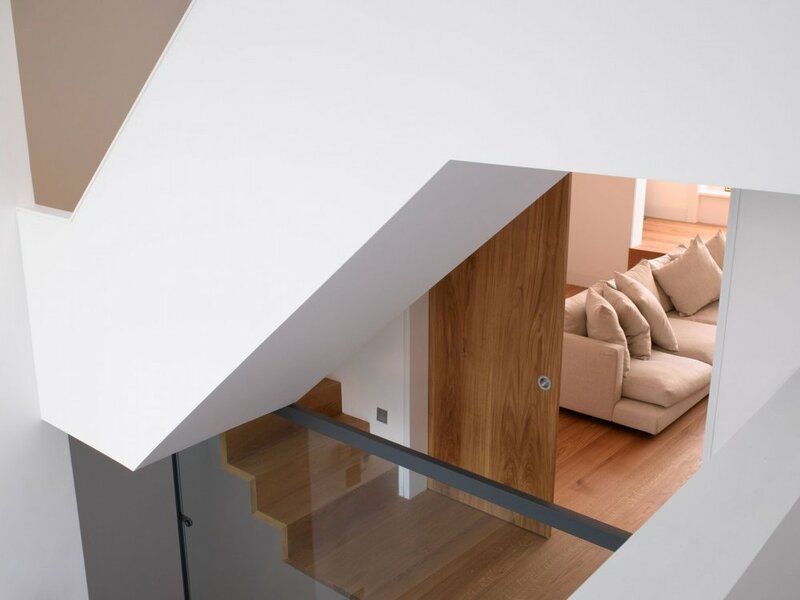 The staircase is a timber and steel construction clad in plasterboard and the same timber flooring. BTA provided a full structural design service.